Ritual magicians dig their tools. Yes, yes; we know that we can do all that cool stuff in our heads, in temples built by vision that feature special effects far beyond what can be achieved in suburban side-rooms and gardens. To the ritual magician the use of material tools is a way to bring spiritual principles into matter, to earth the potential into the real. rented warehouse or a (backyard) woodland glade, the present magical and Pagan revival is seeing a re-emergence of temples for magic, and to the Old Gods. If there’s a more direct material representation of ‘re-enchanting the world’ than restoring temples of the gods and spirits to the West, it escapes me at the moment. However, the ritual magician on the road, or in reduced circumstances, can find herself at a disadvantage. One grows used to one’s habits, and working outside them can require energy that may not be available at the end, say, of a business-trip day. Life’s circumstances can reduce our available space for spiritual work to a dresser-top, and maybe part-time at that. 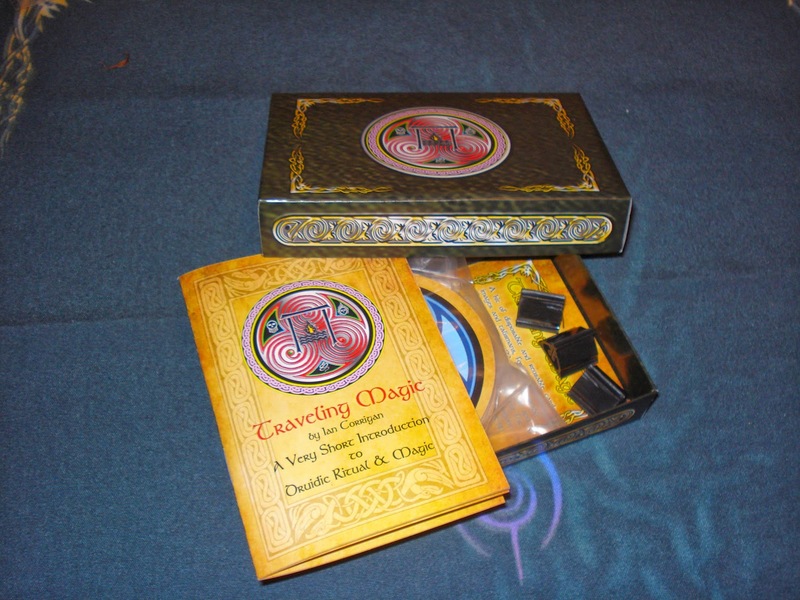 As a result our Pagan movement has produced a variety of min-Altars and travel kits. Our Druidry, being (at 30 years old) a newish thing as religions go, is still short on material supports and props available for easy purchase. I have been making some effort to fill that vacuum, with the sorts of on-line products that I can manufacture from my desk with a computer. The modern world provides such marvelous outlets for creative effort; when I found an on-demand supplier of card decks and games I had a huge geek-attack. The first results of that have already appeared. 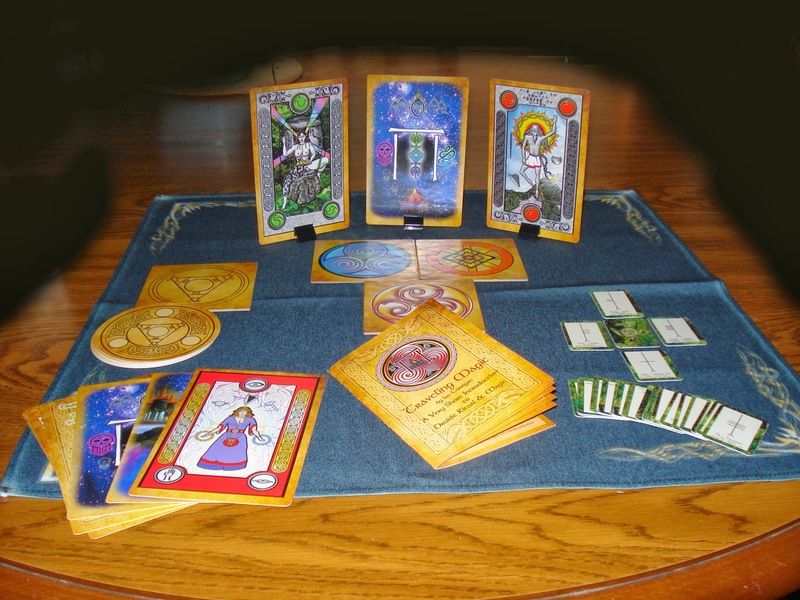 Those are both conventional oracle-decks, useful for divination and other symbol-arrangement activities. My ongoing fascination with the ability to produce professional cards has also taken me in another direction. This amounts to my answer-of-the-week to the portable temple problem. I have suggested the use of Tarot images as cheap-and-easy portable idols to many students over the years. Those concerned with the merit of worshipping pasteboard images should refer to Indian popular religious culture, where posters and post-cards provide deity-images in homes and shops across the region. In this kit I go a step further and design simple colorful images directly for Druidic Paganism, with, I hope, crossover potential for other systems. 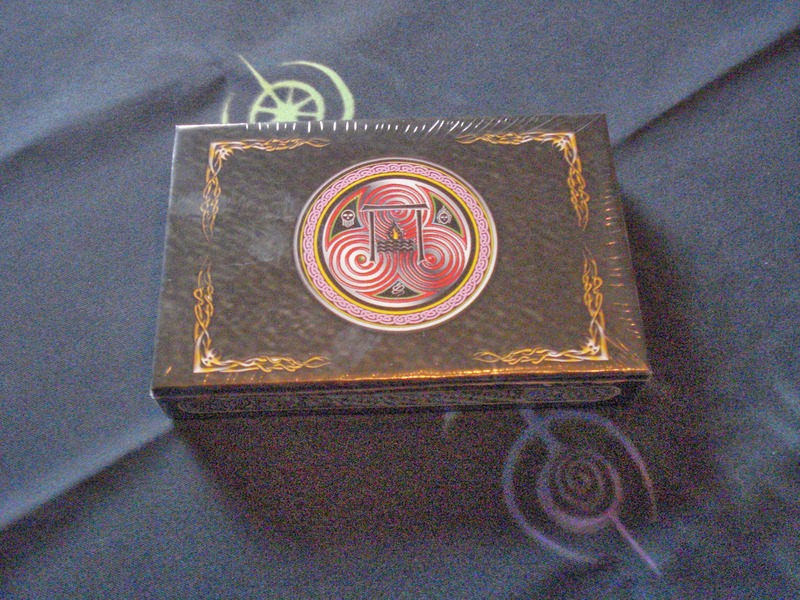 The Traveling Magic Ritual Kit is a portable nemeton. – The Druid’s Hallows tiles are four game-board quality, double-sided tiles symbolizing the Fire, Well and Blessing. They are meant to be the ‘altar’ for your own small well, fire-candle and blessing-glass Careful use should allow the tiles to serve for a long while. 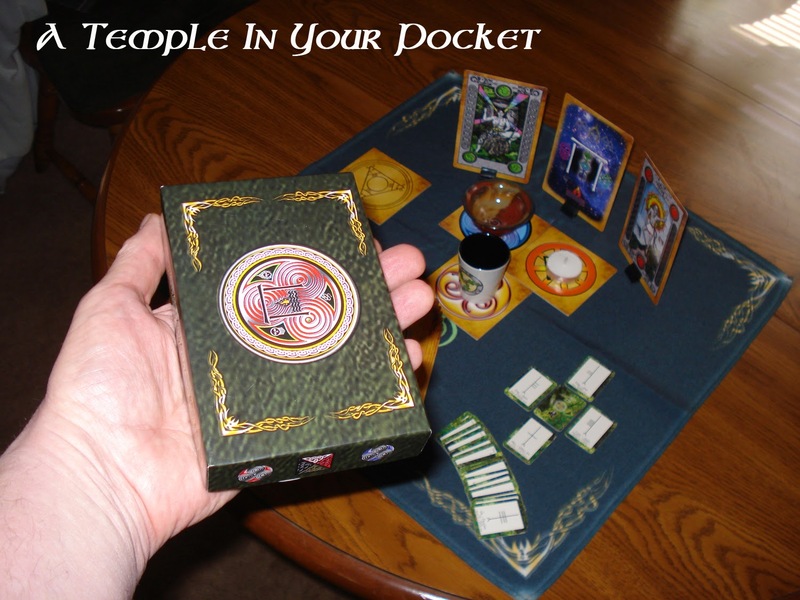 The twelve Temple Image cards provide ready images of the World-Tree, the Gate and the key gods of the rites provided. These can be stood upright, to create a temple atmosphere in small. The tiles serve as ‘altars’ for the simple candle and water-bowl of a travel-altar, (not provided in the kit… I’ll say that again, too…) adding color and symbolism to a dresser-top or coffee-table. Along with the basic Blessing Altar cards the set includes twelve blank spell-cards and a Conjuring Tile along with instruction and resources for arranging them for personal spellwork. but it's available from my Cafe Press shop, at the above link. I’m especially pleased to be able to include a full deck of ogham letters in a quite miniature size. Fortunately the Ogham signs don’t require much graphic detail. Each card is annotated with the letter’s irish name, the translation of the name, the associated tree, and a phrase from lore. The kit includes a 20-page full-color mini-grimoire that instructs in the use of the kit for a basic offering-and-blessing rite with the Spirits. An additional file of ritual work based on the symbols provided will be available for download with purchase. This is one of those “Maybe someone will like it” projects. I like it, that’s why I did it, but I hope it might be useful to others. Travelers; students in dorms or at their parent’s hearths; visiting ritualists in hospitals or even prisons; folks with kids or limited free space might all have a use for a ritual kit that can be carried in a suit-coat pocket, briefcase or purse. This article amounts to advance notice. I’m waiting with bated breath for the final proof to arrive, but everything seems go. You can scope the page for the kit here, and sometime in the 2nd or 3rd week of April it will be available. Incidentally, props to The Game Crafters for making this on-demand service available. Very interesting idea. It looks great! I plan to buy this set along with the "The Ninefold Druid Oracle Deck" very soon! This sounds, in addition to being a niffty travel model, (I personally have several versions of the travel altar depending on how much room I can allocate/travel restrictions) being realistically an incarcerated members only choice for ritual gear/nemeton. Has anyone considered offering them free of charge via a sponsorship model to prisoners? In other words, the prisoner's mentor/sponsor assists/picks up the cost of supplying this to them. What do the folk think 'bout that? Wonderful! I'm about to move into a small apartment with 2 other people. Something like this could be very handy indeed.